When Leo Laporte mentioned Pear Note on MacBreak Weekly, he mentioned that he had not tried it out before because he thought it was “another notebook program for the Mac.” There are a lot of notebook applications out there that help you organize information. Some have referred to these applications as Everything Buckets. 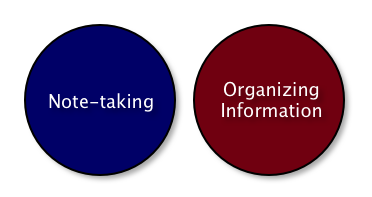 I will not take a stance in favor of or against these (in this post at least), but will instead just point out that organizing information and taking notes are two very different tasks. Some of the organizers out there try to blur the line a bit by providing a very simple note-taking function in addition to their organizational capabilities (usually a simple text editor), but they are still primarily organizational tools, not note-taking tools. Pear Note is not a notebook application; it is a note-taking tool. It aims to help you take better notes, not organize them. Pear Note also provides search functionality so that if you, like me, are not into organizing your notes you can just search for them when you need them. However, if you’re not like me and you really want to organize your notes, fear not. You can easily use Pear Note to take notes and use one of the information organizers out there (or Finder if that meets your needs) to organize those Pear Note notes. I know there are people using Pear Note in conjunction with Together as well as DEVONthink to do just that. Unfortunately, I think far too many people dismiss Pear Note before understanding that it is different from the many notebook applications out there. I wish there was an easy way to distinguish “note-taking” from “notebook,” but I have yet to find it. If you have any ideas of good ways to succinctly communicate the difference, I’m all ears. As promised, Pear Note 1.3.1 has been released. With 1.3.1, all features are now fully functional on Mac OS X 10.6 Snow Leopard. Enjoy!